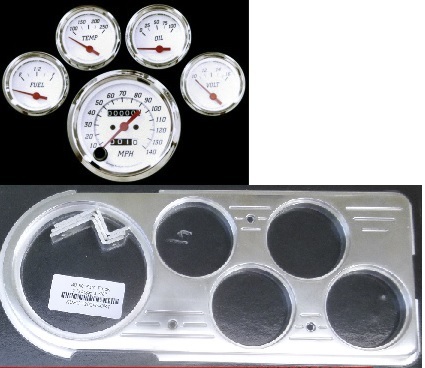 Gauge set includes 3 3/8" mechanical speedometer, 2 1/16" voltmeter, oil pressure, water temperature and fuel level gauge(240-33). Senders include oil pressure, water temperature, fuel level. Set includes bushings, instructions. 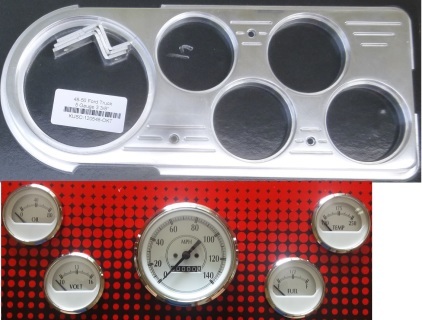 Gauge set includes 3 3/8" programmable speedometer, 2 1/16" voltmeter, oil pressure, water temperature and fuel level gauge(240-33). Senders include oil pressure, water temperature, fuel level. Set includes bushings, instructions and connector with color coded wire. Don's Vintage clusters gauge panel 2820.